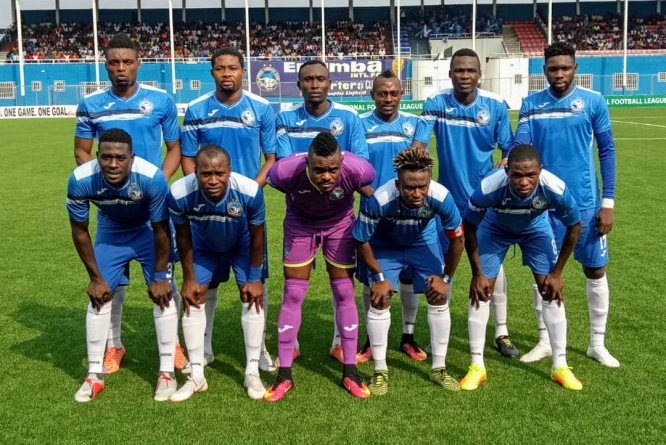 Two-time African champions, Enyimba claimed a deserved 2-0 win over Rivers United in a brilliantly-contested Nigeria Professional Football League (NPFL) game decided on Sunday in Aba. United came into the game in fine fettle as they were unbeaten in four previous matches and sitting proudly at the summit of the division. The ‘Pride of Rivers’ started Sunday’s contest at the Enyimba International Stadium well enough but conceded just before the break, in what ultimately proved to be the turning point of the high-octane encounter. Bashir Abdulrahman scored the decisive goal on 43 minutes after Ibrahim Mustapha’s mazy run carved open the Rivers United rear guard. One minute before the end of regulation time, Enyimba scored the game’s second goal and it was the least their dominance deserved. Wasiu Alalade finished brilliantly after some dare devil dribbling and incisive passing by second half substitute, Chukwuka Onuwa who teed up the goal scorer with a delivery of extraordinary quality. Enyimba could easily have scored more in the second half but profligacy let them down on more than a solitary occasion. Mustapha was denied from point blank range by the Rivers United goalkeeper, Drissa Bamba who produced a save right out of the top drawer in the 50th minute to temporarily keep the score at 1-0. Enyimba never stopped probing in the second half and Abdulraman missed a gilt-edged chance on 71 minutes while Simon Zenke headed over from close range with just Bamba at his mercy 11 minutes from time. The hosts dominated territorially in the second half but United were anything but second best in a first half that ebbed and flowed. Wasiu Jimoh headed a Konan Ruffin cross straight at the Enyimba goalkeeper, Theophilus Afelokhai in the 13th minute. Afterwards, head coaches of both sides, Usman Abdallah (Enyimba) and Stanley Eguma (Rivers United) spoke to the Rivers United official website, www.riversunitedfc.com.ng. (audio files have been attached). Moments earlier, Enyimba had come close to opening the scoring when Abdulrahman chipped Bamba but watched in despair as his effort clattered against the cross bar. The win sees Enyimba climb to fourth in Group A of the NPFL standings with seven points from five matches while Rivers United while Rivers United dropped to third with eight points from five games.